1. Cook pasta according to package directions. Drain, rinse, and place in a large bowl; set aside. 2. Process cilantro and next 7 ingredients in a food processor until smooth, stopping to scrape down sides. 3. 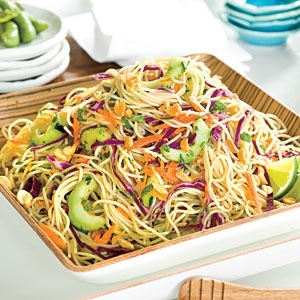 Toss together pasta, cilantro dressing, carrots, and next 3 ingredients. Sprinkle with peanuts, and serve immediately. * Soy sauce may be substituted for fish sauce.